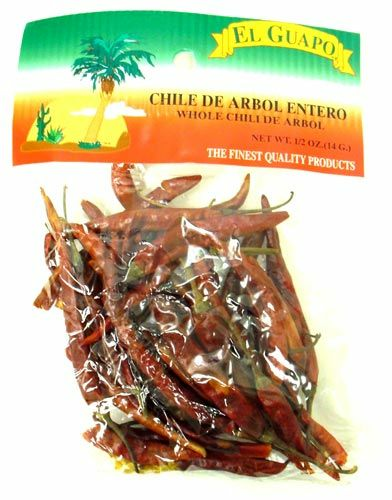 The Chile de �rbol (Spanish for tree chili) is a small, but very potent Mexican chili pepper which is also known as bird's beak chile and rat's tail chile. The chile de �rbol is very hot, and is related to cayenne pepper. Small and plenty hot, Chile de �rbol can also be dried and used to decorate wreaths. For cooking: a few pods thrown into any dish will add extra heat; use for chili, salsa, hot sauce, tacos, soups, stir fry, Thai curry. In pod form the Chile de �rbol is often used to flavor oils and vinegars. Unlike many chiles, Chile de �rbol remains bright red even after drying. The seeds and white arches of the Chile de �rbol can be removed from the pepper to tone down its hotness. When handling Chile de �rbol avoid touching the eyes; hands must be washed thoroughly after handling the pepper or its seeds. El Chile de �rbol es un chile Mexicano, peque�o pero muy potente que tambi�n es conocido como Chile pico de ave y cola de rata. El chile de �rbol es muy picoso y esta relacionado al Chile Cayenne. Peque�o y muy enchiloso, el Chile de �rbol se puede secar y usar para decorar coronas. Para cocinar: algunas vainas agregadas a cualquier platillo lo hara mas picoso, y puede usar el chile para hacer chili, salsa, salsa picante, tacos, sopas, y curry Tailand�s. En forma de vaina el Chile de �rbol es usado para darle sabor a aceites y vinagres. A diferencia de varios chiles, el Chile de �rbol sigue con su color rojo brillante aun despues de seco. Las semillas y venas de el Chile de �rbol pueden ser removidas para bajarle la intensidad al chile. Cuando este cocinando con Chile de �rbol evite tocarse los ojos; y lavese muy bien las manos despues de trabajar con el chile o sus semillas. I roast this chili for a smokey-flavored, hot & spicy salsa that everyone loves. El Guapo brand is a fine quality to use for all cooking. I happen to like using this chili for salsa.